Financial aid is based on the premise that you, and in the case of dependent students, your parents are primarily responsible for providing for your educational expenses, and it is intended to supplement student and family contributions toward educational costs. Financial aid comes from many sources, including federal and state government, private organizations, and Oregon State University’s institutional funds. These funds consist of grants, scholarships, federal work study, subsidized loans, unsubsidized loans, and parent loans. Oregon State uses the Free Application for Federal Student Aid (FAFSA) to determine your financial need and eligibility for various programs. Your financial aid award is designed to meet as much of your financial need and eligibility as possible, and is determined by your need level as determined by the FAFSA, and by the availability of funds. Oregon State offers merit-based scholarships, as well as need and non-need based financial aid. For a complete list of federal eligibility requirements, visit the Federal Student Aid website. What types of aid are available from the FAFSA? 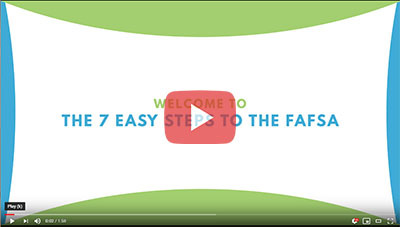 The FAFSA is a federal aid application for both need-based and non-need based financial aid. For eligible students, a FAFSA application will generate a federal student loan offer. Beyond the loan offer, students determined to have high levels of need may also be considered for grants and other types of aid. Review our Aid Types and Aid Limits for Undergraduates pages for additional information. Oregon State offers and administers a number of scholarships and tuition remission programs for qualified international students. Scholarship and award information for newly admitted and continuing students, undergraduate and graduate students can be found in International Student Advising & Services (ISAS). Please note that international students are not eligible for U.S. federal financial aid. 1. Make sure you meet federal eligibility requirements to receive financial aid. You may apply as early as Oct 1st using previous year tax data from 2 years prior (for example, the 2019-20 application will use 2017 tax information). We recommend using the direct data download to import the information from your IRS tax return. More information on how to utilize the IRS data retrieval tool may be found on the FSA website. Remember, if the FAFSA determines you are a dependent student, you must include parent information and the FAFSA cannot be processed until it is signed by both student and parent. A Dependency Status Appeal may be filed with the Office of Financial Aid if you have exceptional family circumstances that you believe should classify you as independent. Please review the Dependency Status Appeal form for additional information on how this appeal process works. 3. List Oregon State on your FAFSA application using our school code, 003210. 4. The priority FAFSA application deadline for Oregon State is February 28th but earlier is better. This date is used to determine eligibility for some need-based aid programs as well as State and Institutional funds. Applications received after the priority deadline will still be eligible for federal aid such as the Pell Grant and Direct Loans. 5. Apply for admission to Oregon State: Apply Online. You will not be considered for any financial aid award until you have applied to the University. 6. After your FAFSA has been received, you may be sent an email request for additional information. Once admitted, you will be able to activate your MyOSU account to view the requirements and the requested forms. If you have been selected for verification, our Verification FAQ’s page will help you with this process. 7. When all outstanding requirements have been satisfied and your FAFSA has been processed, you will receive an email notification that your aid offer is ready to accept. 8. Accept your financial aid award through MyOSU. When transferring to another institution, it is important to understand that each institution may award you different amounts and types of aid. Awards are determined by eligibility, the cost of attendance at each school, and the total number of aid dollars available at each school. To begin the process of requesting aid at a different institution, simply add your new school’s code to the FAFSA, that school will then receive your FAFSA application and begin the process of awarding you financial aid. To start the financial aid process at Oregon State you must first have applied for admission. Below is a helpful checklist to make sure your transition is smooth and successful. 1. Apply for admission to Oregon State: Apply Online. 2. Add Oregon State to your financial aid application (FAFSA) by adding our school code (003210) online at fafsa.ed.gov or by calling the FAFSA processor at 1-800-433-3243. 3. Contact your current school's financial aid office and cancel any financial aid for subsequent terms. You cannot receive aid at more than one school at a time so it is critical that this process occur. 4. After your FAFSA has been received, you may be sent an email request for additional information. Once admitted, you will be able to activate your MyOSU account to view the requirements and the requested forms. If you have been selected for verification, our Verification FAQ’s page will help you with this process. 5. When all outstanding requirements have been satisfied and your FAFSA has been processed, you will receive an email notification that your aid offer is ready to accept. 6. Accept your financial aid award through MyOSU. Oregon State is committed to recruiting and retaining motivated, diverse, and driven students. In an effort to assist with the expenses involved in a high caliber education, incoming students are automatically considered for University Scholars Program scholarships based on their application for admission and completion of the scholarship portion of the application at the time of admission and prior to the February 1 deadline. New and returning students may also apply for additional scholarships through the ScholarDollars application portal. Undocumented Students: Undocumented students are not FAFSA eligible but additional funding resources may be found on the OSAC, Admissions and Gear Up websites. International Students: OSU offers and administers a number of scholarships and tuition remission programs for qualified international students. Scholarship and award information for newly admitted and continuing students, undergraduate and graduate students can be found on the International Admissions webpage. The FAFSA application is available for submission beginning October 1st each year. You will submit your FAFSA using the tax information from 2 years prior. That means your 19/20 FAFSA will use the information from the taxes you filed in 2017. Most students and parents should be able to download their tax information into the FAFSA using the IRS data retrieval tool . OSU's FAFSA Priority Deadline is February 28th but earlier is better! The initial FAFSA filing date is used for awarding limited funds so earlier is better. FAFSA applications submitted after February 28th may still be eligible for federal financial aid such as the Pell Grant, FORD Direct Loans, and PLUS Loans. Now is a good time to start searching for scholarships for the next year. There are many resources available to aid you in your search, such as the OSU departmental scholarship application, Oregon Office of Student Access and Completion Scholarship (OSAC) Application for Oregon residents, and a number of online search engines as well! If you are an incoming student who wants to be considered for OSU institutional scholarships, the Admissions application deadline is February 1st. OSU departmental scholarship application priority deadline is February 1st and main deadline is February 15th. OSAC Early Bird Scholarship Application deadline is February 15 - 5pm PST each year: Early Bird deadline. Complete applications (including transcripts) submitted by this date and time receive an early review, and error-free Apps will be entered into a drawing for one of several $1,000 Early Bird scholarship awards. Visit the OSAC website for additional information. Oregon State FAFSA Priority Filing Deadline is February 28th! FAFSA applications submitted after February 28th may still be eligible for federal financial aid such as the Pell Grant, and FORD Direct Loans. OSAC Scholarship Applications are due March 1st. Visit OSAC for more information. Financial aid award letters are sent to incoming priority deadline applicants.